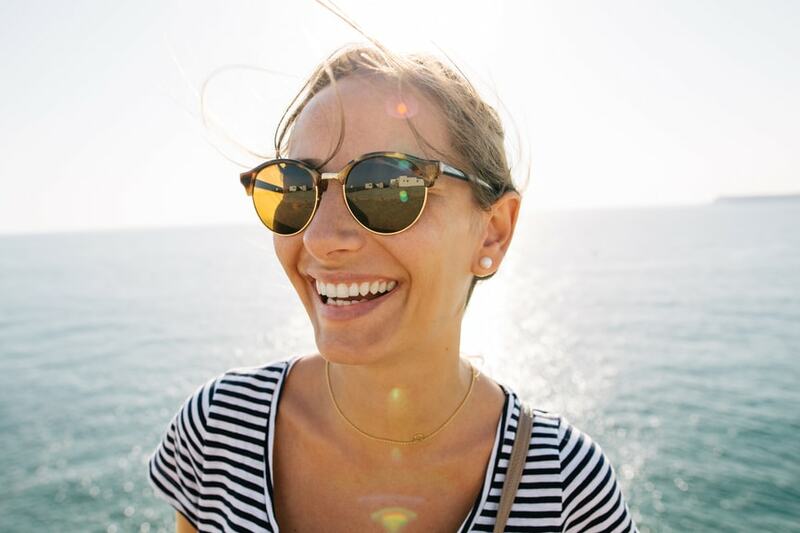 Combine ACUVUE® contact lenses in your daily routine with wraparound sunglasses and a wide-brimmed hat to experience the freedom and confidence to enjoy life to the fullest. UV isn’t just a problem in the summer either as it can cause damage all year round. For example, exposure can be higher when sunlight is reflected off snow. Once outside, almost any location, from ski slope to sea level, and any pastime from tennis to walking exposes us to UV radiation whether from a direct or reflected source. Even under water, at half a metre depth, UV radiation is still 40% as intense as at the surface. Furthermore, most people don’t realize that UV eye exposure is greatest during early morning and late afternoon – and in non-equatorial regions – when the sun is lower in the sky. This makes exposure of eyes to harmful UV rays more likely. Not only can UV rays pierce cloud cover, they reflect off all surfaces at different – and often surprisingly high – degrees. For example, UV radiation is still 95% as intense when reflected off water. Sunglasses are an essential part of protecting your eyes from UV. The added protection from ACUVUE® Brand Contact Lenses is important even if you wear sunglasses which may only provide partial protection – UV light can ‘leak’ around the edges and cause damage.4 And unlike sun protection for the skin, the UV-blocking ingredient is incorporated into the ACUVUE® Brand Lens material permanently – it won’t peel or wear off. Wearing UV-blocking contact lenses every day means that you have additional protection for your eyes. *All ACUVUE® Brand Contact Lenses have Class 1 or Class 2 UV-blocking to help provide protection against transmission of harmful UV radiation to the cornea and into the eye. UV-blocking contact lenses are NOT substitutes for protective UV-blocking eyewear such as UV-blocking goggles or sunglasses because they do not completely cover the eye and surrounding area. ** JJVC Data on file 2014. ‡ UVB and UVA blocking percentages are taken on average across the wave length. 1. Sliney, David H. Intraocular and Crystalline Lens Protection From Ultraviolet Damage. Eye & Contact Lens July 2011; 37: 250–258. 2. Sasaki H, Sakamoto Y, Schnider C et al. UV-B exposure to the eye depending on solar altitude. Eye & Contact Lens 2011;37:4 191-195. 3. Schnider C, Sasaki H, Sakamoto Y et al. UV Danger in the UK? U Bet! BCLA 2010 Conference presentation abstract. 4. Kwok LS, Daszynski DC, Kuznetsov VA, Pham T, Ho A, Coroneo MT. Peripheral light-focussing as a potential mechanism for phakic dysphotopsia and lens phototoxicity. Ophthalmic Physiol Opt 2004;24(2):119-29. WARNING: UV-blocking contact lenses are NOT substitutes for protective UV-blocking eyewear such as UV-blocking goggles or sunglasses because they do not completely cover the eye and surrounding area. You should continue to use UV-blocking eyewear as directed. NOTE: Long-term exposure to UV radiation is one of the risk factors associated with cataracts. Exposure is based on a number of factors such as environmental conditions (altitude, geography, cloud cover) and personal factors (extent and nature of outdoor activities). UV-blocking contact lenses help provide protection against harmful UV radiation. However, clinical studies have not been done to demonstrate that wearing UV-blocking contact lenses reduces the risk of developing cataracts or other eye disorders. Consult your eye care practitioner for more information. Always read the label. Use only as directed. Your optometrist will advise if this product is suitable for you. ® Registered trademark © , Johnson & Johnson Vision, Johnson & Johnson Vision Care a division of Johnson & Johnson Pacific Pty Limited 2001-2019.This site is published by Johnson & Johnson Vision Care, a division of Johnson & Johnson Pacific Pty Limited, which is solely responsible for its content. It is intended for use by residents of Australia. ACUVUE OASYS®, 1-DAY ACUVUE® TruEye®, 1-DAY ACUVUE® MOIST, ACUVUE® ADVANCE, ACUVUE® 2, HYDRACLEAR®, LACREON®, 1-DAY ACUVUE® DEFINE®, NATURAL SHIMMER®, NATURAL SPARKLE®, NATURAL SHINE®, STEREO PRECISION TECHNOLOGY®, BLINK STABILIZED®, are trademarks of Johnson & Johnson Vision Care, Inc.